Looking for a good ten pin alley game. 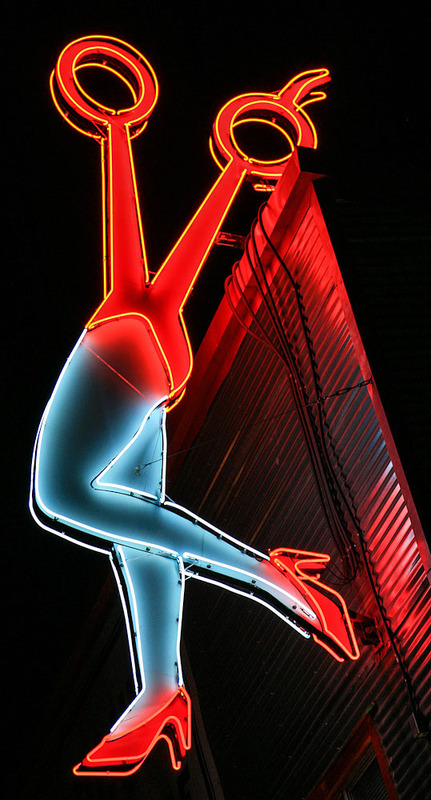 Better yet, looking for a good neon sign to visit? Then Sheridan Lanes in Tulsa is the place. 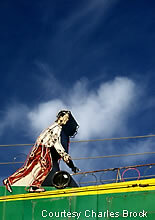 Here's a close-up of the bowler figure on the Sheridan Lanes sign. And yes, the figure is outlined in neon. How about a nice game of bowling? Lazy? Aw heck, then let's just drive-through and bowl. Featuring a marquee that's still in great shape, the 66 Bowl is the place to be if you're in Oklahoma City. Plus, it's right off Route 66. This throwback of a ten pin alley features 24 lanes. 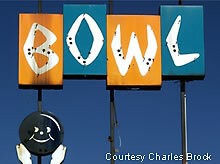 For more, see Roadside Peek's Lost Treasures feature on the 66 Bowl. When you think of the Rose Bowl, do you think of College football and New Years Day? 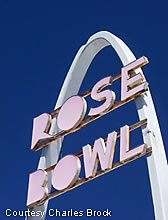 If you don't, then you must have seen the Rose Bowl in Tulsa and its fantastic arching sign that somewhat resembles the famed Arch and Arch Motel in St. Louis. Best of all, it's located off of the old Route 66. 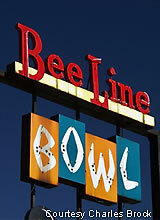 The Bee Line Bowl in Okmulgee features a few great looking marquees with lettering hearkening back to the golden era of bowling alleys. The photo on the left even shows the happy bowling ball face. Or is it a bee? A bowling bee?